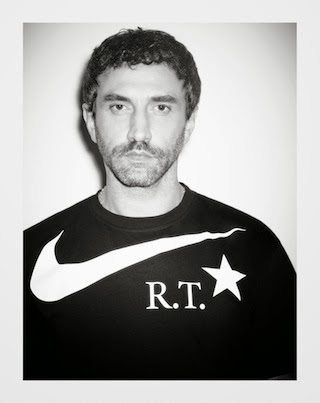 S A M I Y A: Riccardo Tisci Announces Collaboration with Nike! 2014 Has started with a bang for Riccardo Tisci, he announced his upcoming collaboration exclusively to Style.com earlier today! Givenchy's creative director Riccardo Tisci will be collaborating the famous sportsbrand Nike. The collection will have the logo NIKE RT, which you can see on Tisci himself. Neiter Riccardo nor Nike went into the details about the categories that will be part of the collaboration. But like Nicole Phelps mentioned on Style.com, it's safe to say that footwear will be a big part of the collection. Nike has rarely collaborated with fashion designers as they have with sports people. ''When I got the call, it sounded so strong, so perfect for my DNA. It's a big honor for me, especially because they're always working with sports people.'' Tisci continued. ''I couldn't bring them technology, instead I brought my style, what people like me for and what the young generation follows me for,'' Tisci added. He also told Style.com that the collection is strong without being loud. Take a look at the portrait-video below what might give you some clues. The collection will arrive in stores and on Nike.com this spring. OGMYGOD I AM SO EXCITED ABOUT THIS!!! ALL CAPS!